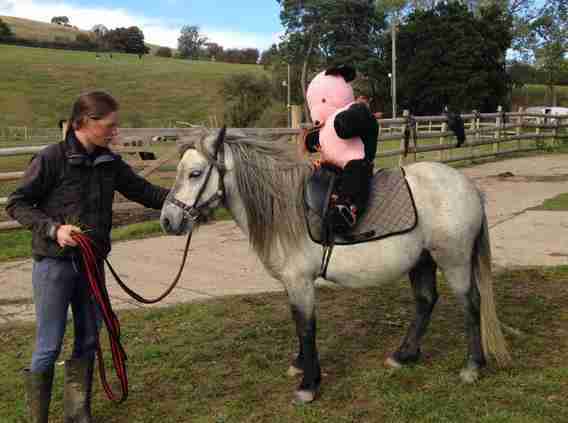 Bertie the pony is a wee little horse, standing just over three-and-a-half feet high - but he'd very much like to prove he could be the perfect riding companion for someone who's also somewhat smallish in size. 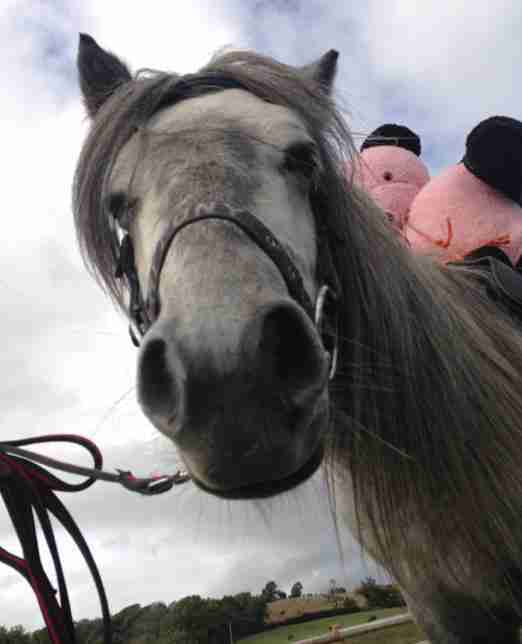 The lovable gray gelding was rescued by Totem Horses in Wales, a group that readies unwanted equines for adoption. To improve his chances of finding a new home, volunteers needed to get Bertie acquainted with carrying a passenger, but everyone on staff was a bit too heavy for him to practice with. 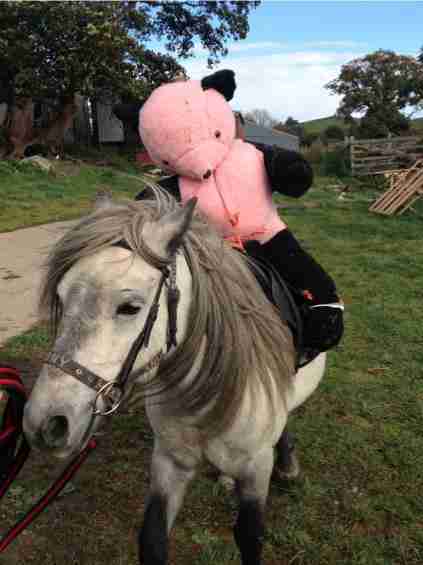 Fortunately, they knew just the jockey who could help - a big snuggly teddy bear. "Before coming to us Bertie had had very little handling and so was a blank canvas but he has come on in leaps and bounds," writes Totem Horse volunteer Holly Higginbotham. 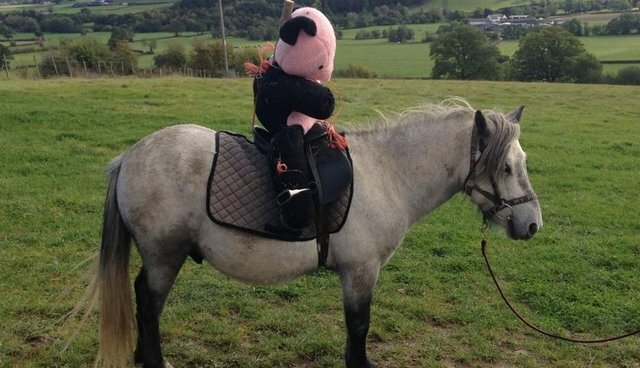 "Bertie has only been ridden thus far by 'Riding Teddy' who is a decent weight and wobbles a lot but causes Bertie no concern. 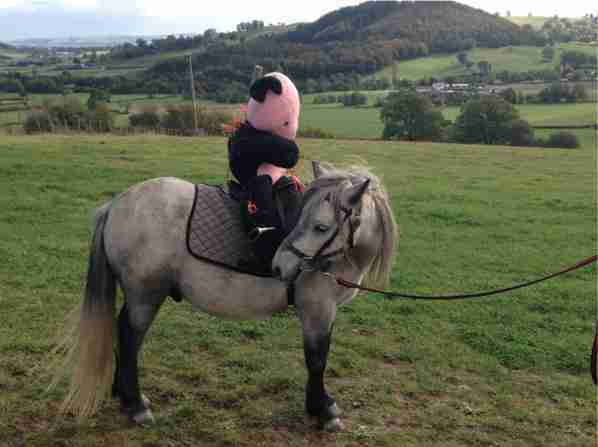 Riding Teddy has been on Bertie whilst he is lunged and long-reined and enjoys a walk and trot. Bertie is now ready for the next stage of his education." All this comes as a second chance for little Bertie. The 3-year-old pony had originally been slated for slaughter by his former owner, a breeder who saw no reason to keep him around. Thankfully, rescuers were able to intervene, giving Bertie the opportunity to live up to his full potential. Volunteers at the rescue center are optimistic that with all the riding practice he's received, the petite pony will bring joy to whoever the lucky person is who decides to adopt him. "Bertie is a very sweet-natured little pony who is good and quiet to handle and is eager to please and very honest, especially for his age," Higginbotham writes. "Everyone at Totem loves Bertie to bits and wants to find him a permanent loving home."